Saint Martha is known as the patron saint of servants, who, as you can imagine, got pretty damned sick of being subservient. They petitioned her to help them cope and rise out of their slavery. Saint Martha returns lovers, keeps homes happy and can help turn any situation around so you are in control of it-you will decide what happens. Martha is loyal-Anyone I know who has worked with Saint Martha has said they have never been let down and those who honor her daily have very happy homes. She is also known for easing separations, making divorce or break-ups safe and easy. She wants your home life to be happy, and so do I! Set a plain altar (remember, Martha has humble associations) with a white, red, and yellow candle. Anoint them with my oil every Tuesday for 9 weeks-this is called the "9 Tuesdays of Saint Martha" and recite the prayer below then state your petition to her. 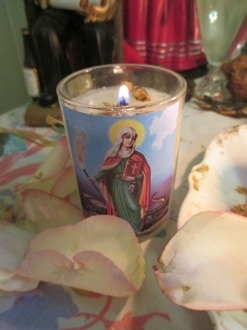 Holy Martha, I surrender to your guidance and protection, honoring your wishes. To provide my act of contrition and actions of grace I shall offer this light in your honor every Tuesday. Console me in my sorrows. Bring happiness to my home and ease to my life. Provide me and all my family with our daily needs. I implore you with your infinite mercy to grant the great favor I ask. Saint Martha the Dominator is often depicted as Mami Wata, so you may want o look up information about her and honor her as well. Her candle is dressed with licorice and calamus root as well as amber and musk oils.